Baby S has loved the My Little Piccolo Organic range. We first tried them back in February and she really enjoyed the exciting combinations. I had mentioned that I thought My Little Piccolo Organic could try a new range of thicker pouches with proper lumps in for the next stage in weaning. Well it would seem I hadn't been the only one with that thought, My Little Piccolo have brought out a whole new range for babies over 10 months! What is they say, great minds think alike? The new stage 3 range has four new recipes for your little one to try. We have been trying out the Baby pasta with sweet potato bolognese, baby pasta with Vegetable and kale pesto and the quinoa with vegetable ratatouille which all have a pinch of basil in too. The final recipe available in the range is quinoa with pumpkin and sweet potato with a dash of goats cheese. How good do they all sound? Each My Little Piccolo Stage 3 pot comes in a lovely little outer cardboard sleeve which holds two small plastic pots that contain the pasta/quinoa and the sauce. On the back of the sleeve you can find the microwave instructions to heat the pots up.It's quick and easy just shake the pots well and pour the pasta (or quinoa) into the sauce and heat in the microwave. There's nothing to it! The great thing is they don't need to be heated up at all, so they are perfect for taking out and about with you for quick lunches or dinners. Inside each sleeve is some information on what My little Piccolo is all about, the Mediterranean balanced diet. As you can see above there is a chart for which food are consumed daily in the diet so that can include milk, vegetables and fruits while on a weekly basis it would have chicken, fish and other proteins while more forms of red meats are found at the top in the monthly section. I like that all the information is right there on the packaging to help you make informed decisions and to be aware of what your baby is really getting from their meal. Which leads me to another feature inside the sleeve. It shows you all the ingredients which are found inside your My Little Piccolo meals! I love that it not only tells you but each had their own picture to make it very clear. Perfect for a quick glance and knowing what you giving them. Baby S couldn't wait to get stuck in, she took quite the interest in the lovely packaging but what she really loved was what it held inside. She watched (very impatiently, I might add) as I got the My Little Piccolo Baby pasta with sweet potato bolognese ready for her to try along with this adorable little wooden spoon. Within seconds of me starting to feed her she was wanting more and more! As you can see above she wasn't even waiting to have an empty mouth for the next spoonful. At one point she gave up on me feeding her and started to take the food filled spoon. A huge first for Baby S, she got it in her mouth too! We did take the My Little Piccolo Baby Pasta with Vegetable and Kale Pesto when out visiting family. I must say this was my least favourite but only because the pesto green colour made it look a bit off putting. Although Baby S didn't seem to care very much about the appearance. It smelt lovely and she enjoyed the majority of the pot. By the time it came to trying out the My Little Piccolo Quinoa with Vegetable Ratatouille recipe she was becoming a little pro. Although I tried I couldn't get one photo of her not moving. As you can see she was rather determined to get the spoon and give it a try. I think this one has to be the favourite for her. She almost ate the entire bowl which is a little bigger than her usual portion. We have loved all of the My Little Piccolo range that we have tried, Baby S has not yet found one she doesn't like but I must say that this stage 3 range has to be at the top of our favourites. It's perfect for children moving onto lumpy food and even beyond, the lumps and chunks are perfect for toddlers learning to use a spoon too. If your at this stage in your weaning journey I would highly recommend you give them a try. The variety of new flavour combinations and textures is perfect for adding to your weaning journey. Piccolo Organic Baby Food Stage 3 range is available in Tesco (£2.20). 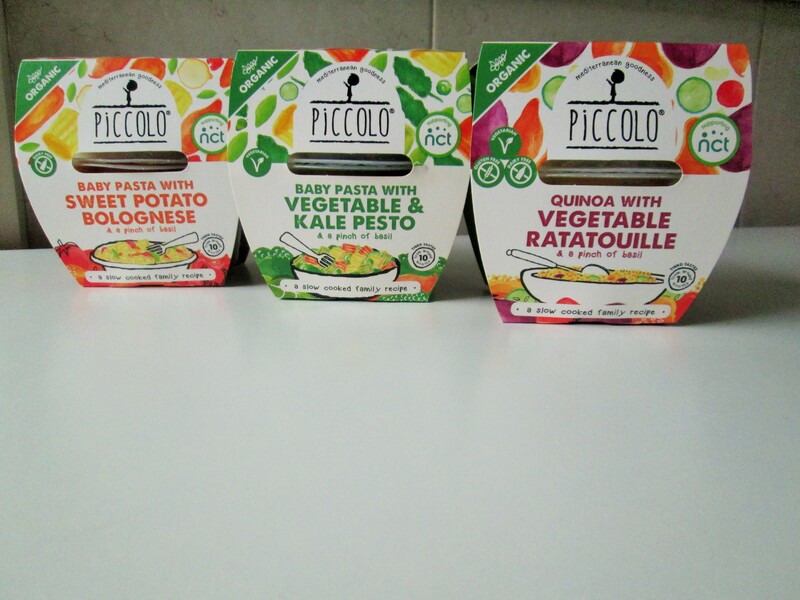 My Little Piccolo Quinoa and Vegetable Ratatouille and My Little Piccolo Baby Pasta with Sweet Potato Bolognese are available online. Disclaimer: We received the products featured in this post in return for an open and honest review. All thoughts and opinions expressed above are my own.